Although set within a manoeuvre framework the infantry battle will continue to be largely one of attrition. Do you think this is true? It’s a statement that fell from doctrine ten years ago but its spirit endures. 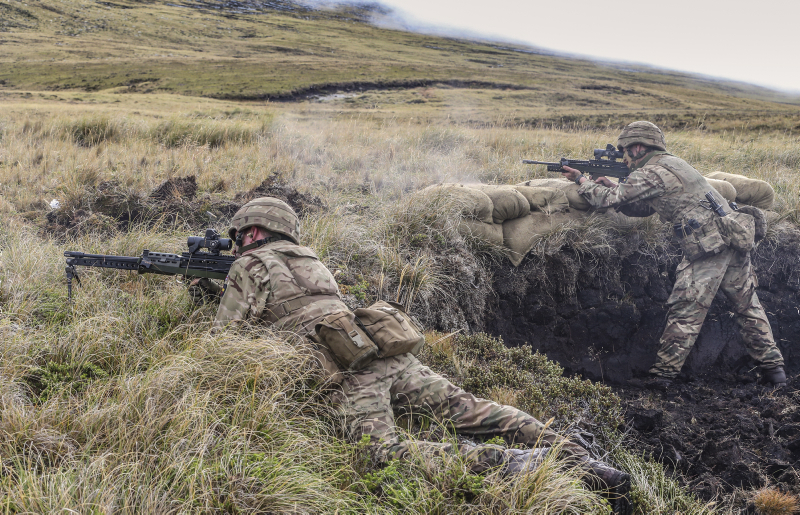 Junior commanders, particularly in the infantry, often say their job is to close with and kill the enemy. This reflects the first problem with manoeuvre and manoeuvrism: it seems to be something that is above most soldiers’ pay grade. The second problem with manoeuvre is that it’s all rather woolly. Doctrine discussions drift into concepts like momentum and simultaneity or disruption and dislocation – words that mean little to a section commander who’s got to clear a building or to a company commander who’s defending a city block. Manoeuvrist jargon doesn’t say whether you’ll get more of the enemy to surrender by outflanking them or whether you’ll suppress them for longer by mixing fires. But manoeuvre is back in fashion. Everyone is quoting Churchill: ‘Battles are won by slaughter and manoeuvre. The greater the general, the more he contributes in manoeuvre, the less he demands in slaughter’. But the vagueness of manoeuvrism makes it difficult to get the balance right, to see the true value of manoeuvre and to see how it matters to junior leaders. We’re living in a material world and I am a material girl. Manoeuvrism also falls on rocky ground in MOD Main Building and Defence Equipment & Support at Abbey Wood. Like Madonna, defence accountants have no moral or intellectual component: they care only for the material aspects of fighting power. This isn’t because they’re bad people, it’s because of an unavoidable bias in accounting and research methods. Whenever anyone tries to balance the books between manoeuvre and attrition, the attrition wins because it has numbers to back it up. A new gun or missile can be judged on its hit probability or blast radius and these numbers can be set against the cost of the weapon. There’s no way to measure the psychological effect of manoeuvre. And manoeuvre costs a lot. The organisation and skills needed to combine arms and seize opportunities under stress demands a lot of collective training. The cost in infrastructure, simulators and salaries soon stacks up, but most of the benefit from this expense – enemies surrendering or fleeing – is not represented in spreadsheets. I’m worried that, as in the 1990s, the current manoeuvrist revival will only be fashionable for as long as it sweetens the pill of “doing more with less”. A few years down the line, when having less has become the norm, I suspect the money will shift back to the numbers that support attrition. There was no room for manoeuvre and no scope for cleverness. Studies in the 1990s were able to put a value on operational-level shock but achieving it was difficult and the effects varied widely. Many knifelike thrusts ended in disasters like Arnhem, and strikes at soft underbellies created fiascos like Anzio. A cynic looking at the historical data might even suggest that the psychological effects of operational manoeuvre were only possible with overwhelming combat power or an incompetent enemy. A good example is Op Veritable where, as Gen Horrocks pointed out, manoeuvre and cleverness were not an option for him and his staff. But they were an option for his unit and sub-unit commanders. Almost daily they would use manoeuvrist cleverness to convince hundreds of fanatical fallschirmjäger to surrender. By applying the tricks that every armchair general knows (but only highly trained soldiers can actually do) colonels and corporals captured far more Nazis than when they relied on blunt force. They saved their own men’s lives by doing it. Make it obvious that he’s going to lose. By chance, these align with two of the main effects in tactical psychology(Murray, Brains & Bullets), which has attempted to quantify the effects of low-level manoeuvre. In a recent project funded by the Defence Accelerator, we (John Salt, Edmund Bennett and I) used analysis techniques developed for warfighting experiments at BATUS to test some of these effects using a sample of 42 twentieth century battles. This is what we found. Good ol’ rock. Nothing beats that. Psychologically, combined-arms isn’t just rock-paper-scissors. By presenting two threat types at once it’s more like being caught between a rock and a hard place. One threat (small arms fire, for example) can pin soldiers down, but people can usually work out how to respond using an efficient, almost automatic mental processes. When there’s a combination of threat types –whether it’s armour and infantry or rifles and UGLs– there is a shift to slower, more conscious decision-making that is much more likely to yield a passive response. In theory, closely combined-arms should have an effect like suppressive fire on steroids. 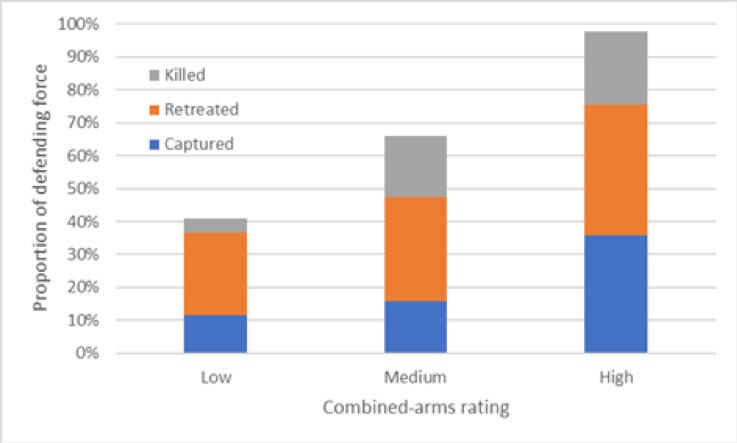 As the first graph suggests, combining threat types more closely greatly increased the chance of winning – partly because more enemies were killed, but mostly because a lot more enemies surrendered. There seemed to be little effect on the number withdrawing, perhaps supporting that passive response idea. The morale of the individual depends largely upon his estimate of his own chance of escaping death or injury, and of the chance of success of the enterprise in which he is engaged. Being outflanked seems to have a psychological effect because it’s such a powerful clue that your side isn’t winning. 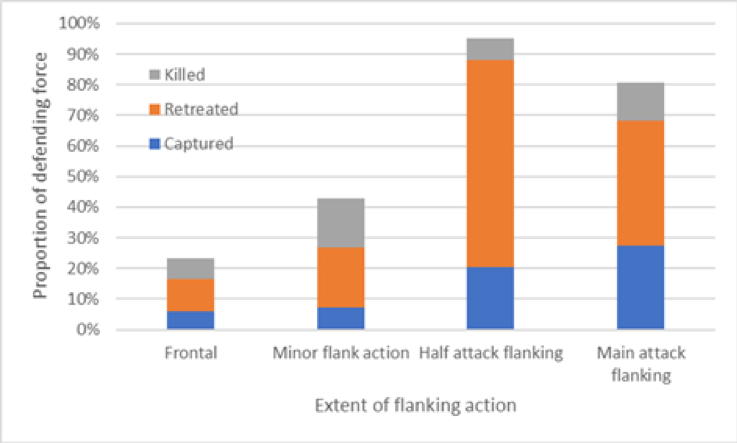 Despite every schoolboy knowing that flanking has a morale effect, research has had trouble producing a valid number for it. The second graph shows the best figures we have. Frontal attacks fail most of the time, “minor flanking” actions (e.g. a platoon or two snurgling in a battalion attack) are a bit more successful and “half flanking” (a company or two) almost always win. But then, when the main attack is flanking there is less success. We’re still looking into the reasons for this but it’s possible that a big hook is easier to spot and counter. The closer we get to the enemy the further we get from each other. In this quote the great man was talking about the collapse of cohesion just before a bayonet charge. It reflects an effect from tactical psychology that does not appear in doctrine and is based on the observation that people don’t like interpersonal, in-your-face violence and tend to opt out of the fight as it gets closer. The ultimate opt-out is to surrender. In theory, this effect should be the same for attackers and defenders, but in our sample the attackers had usually used tricks like combined-arms and flanking, so closing with the enemy was like the icing on the cake. Sadly, we’ve got no handy graph because there’s an obvious problem with cause and effect. Sometimes there’s a cellar full of scared men waiting to put their hands up; sometimes there a fight right up until the last few metres and then a Mexican wave of surrendering happens. I suspect that many readers, on the basis of their Afghan experience, distrust my graphs showing enemies surrendering and might be thinking that warfare has changed. Judging by the MOD’s recent output, warfare tomorrow is all about cyber, drones and getting likes on Facebook. But I’m with Gen Mattis on this one: if it worked in the Second World War, it should work now. It’s simply not true to say that the infantry battle is a thing of attrition. Yes, a lot of people get killed but most casualties are to indirect fire. In the close battle, more people surrender than get killed, and more withdraw than surrender. This dataset is messy but it’s fairly clear that tactical manoeuvre has a bigger psychological than physical effect. It is something that junior commanders, especially in the infantry, can do but only if they are organised and trained to do it. Investment decisions should give due consideration to the value tactical manoeuvre, not just the kit but the organisation and training needed to do it. If not, the current manoeuvrist revival will go the way of the others. The money will follow the numbers and go to lethal kit instead of effective tactics. The data we’ve got so far is good enough for gaming (this project was designed to put real combat data into a computer game) but I wouldn’t bet anyone’s life on it. Yet it’s fundamental to doctrine and training, to problems like soldier load, and to force development concepts like Strike. We’re looking to get better data. I’ll let you know how it works out. Dermot is military psychologist who also does operational research. He is trying to do a PhD on the tactics that made Nazis run, hide and surrender in Op Veritable to see whether they can be applied on future ops. If you’d like to help or tell him how wrong he is please follow the link at www.wapentakes.com/tactical-psychology.